هدف از این پژوهش، بررسی اثر شرایط خشک‌کردن پاششی و نیز شرایط نگهداری بر برخی ویژگی‌های فیزیکی ـ شیمیایی پودر عصارۀ سماق بوده است. پودر سماق در سه دمای هوای ورودی (140، 160 و 180 درجۀ سانتی‌گراد) و سه غلظت مالتودکسترین (10، 20 و 30 غلظت) و جریان هوای همسو با خوراک ورودی تولید شده است. دانسیتۀ توده و ضربه، زاویۀ ریپوز، شاخص تراکم‌پذیری و شاخص پیوستگی، میزان رطوبت، ترکیبات فنولی و فعالیت آنتی‌اکسیدانی تعیین گردیده است. پودرها به مدت 90 روز در تاریکی (6 و 20 درجۀ سانتی‌گراد) و روشنایی (20 درجۀ سانتی‌گراد) نگهداری شده‌اند و تغییرات فنول کل و فعالیت آنتی‌اکسیدانی آنها ارزیابی گردیده است. با افزایش دما و غلظت مالتودکسترین، جریان‌‌پذیری پودرها افزایش یافته ولی دانسیتۀ توده و ضربه و ترکیبات فنولی کاهش یافته است. دماهای بالاتر و غلظت‌های پایین‌تر مالتودکسترین باعث کاهش فعالیت آنتی‌اکسیدانی نمونه‌ها گردیده است. برای پایداری و یا حتی بهبود ترکیبات فنولی طی دوره‌های نگهداری طولانی‌مدت، نگهداری در شرایط دمای پایین و تاریکی مناسب‌تر است. 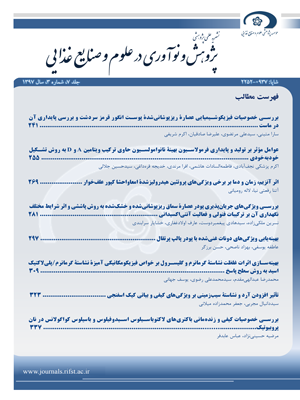 احمدی‌راد، م.، امام‌جمعه، ز. و اسدی، ح. 1395. بهینه‌سازی فرایند خشک‌کردن پاششی آب زغال‌اخته با استفاده از روش سطح‌پاسخ. علوم و صنایع غذایی ایران، 50(13):67-87. سازمان ملی استاندارد ایران. 1389. غلات و فراورده‌های آن ـ روش اندازه‌گیری رطوبت ـ روش مرجع. شمارۀ 2705. شهیدی، ف.، وریدی، م.، محبی، م.، نوشاد، م. و خلیلیان‌موحد، م، 1393. بهینه‌یابی شرایط خشک‌کردن پاششی آب انار با استفاده از روش سطح-پاسخ. پژوهش و نوآوری در علوم و صنایع غذایی، 2(3):129-142. Aaby, K.; Wrolstad, R.E. ; Ekeberg, D., & Skrede, G. 2007. Polyphenol composition and antioxidant activity in strawberry purees; impact of achene level and storage. Journal of Agricultural and Food Chemistry, 55(13):5156-5166. Abdullah, E.C., & Geldart, D. 1999. The use of bulk density measurements as flowability indicators. Powder Technology, 102(2):151-165. Azimi, A.A., Delnavaz, H.B., & Mansour, G.A. 2006. Antifungal effect of aqueous alcoholic and phenolic extracts of seed and leaves of sorghum bicolor against fusarium solani fusarium poa in persian. Medical Plant, 6(1):26-32. Bakowska-Barczak, A.M., & Kolodziejczyk, P.P. 2011. Black currant polyphenols: their storage stability and microencapsulation. Industrial Crops and Products, 34(2):1301-1309. Bhandari, B.R., Datta, N., D’Arcy, B.R., & Rintoul, G.B. 1998. Co-crystallization of honey with sucrose. LWT-Food Science and Technology, 31(2):138-142. Bhandari, B.R., Dumoulin, E.D., Richard, H.M.J., Noleau, I., & Lebert, A.M. 1992. Flavor encapsulation by spray drying: application to citral and linalyl acetate. Journal of Food Science, 57(1):217-221. Boonyai, P., Bhandari, B., & Howes, T. 2004. Stickiness measurement techniques for food powders: a review. Powder Technology, 145(1):34-46. Bors, W., & Michel, C. 2002. Chemistry of the antioxidant effect of polyphenols. Annals of the New York Academy of Sciences, 957(1):57-69. Brand-Williams, W., Cuvelier, M.E., & Berset, C. 1995. Use of a free radical method to evaluate antioxidant activity. LWT-Food Science and Technology, 28(1):25-30. Çam, M., Içyer, N.C., & Erdogan, F. 2014. Pomegranate peel phenolics: microencapsulation, storage stability and potential ingredient for functional food development. LWT-Food Science and Technology, 55(1):117-123. Carr, R.L. 1965. Evaluating flow properties of solids. Chemical Engineering, 18:163-168. Desai, K.G.H., & Jin Park, H. 2005. Recent developments in microencapsulation of food ingredients. Drying Technology, 23(7):1361-1394. Embuscado, M.E. 2015. Spices and herbs: natural sources of antioxidants-a mini review. Journal of Functional Foods, 18(B):811-819. Ersus, S., & Yurdagel, U. 2007. Microencapsulation of anthocyanin pigments of black carrot (daucus carota L.) by spray drier. Journal of Food Engeeniring, 80(3):805-812. Fang, Z., & Bhandari, B. 2011. Effect of spray drying and storage on the stability of bayberry polyphenols. Food Chemistry, 129(3):1139-1147. Fazaeli, M., Emam-Djomeh, Z., Kalbasi Ashtari, A., & Omid, M. 2012. Effect of spray drying conditions and feed composition on the physical properties of black mulberry juice powder. Food and Bioproducts Processing, 90(4):667-675. Ferrari, C.C., Marconi Germer, S.P., Alvim, I.D., & de Aguirre, J.M. 2013. Storage stability of spray-dried blackberry powder produced with maltodextrin or gum arabic. Drying Technology, 31(4):470-478. Fischer, U.A., Carle, R., & Kammerer, D.R. 2013. Thermal stability of anthocyanins and colourless phenolics in pomegranate (punica granatum L.) juices and model solutions. Food Chemistry, 138(2-3):1800-1809. Fitzpatrick, J.J. 2005. Food powder flowability. Power Handing and Analysis. P: 247-260. In C. Onwulata (Ed. ), Encapsulated and powdered foods. New York, UK. Flores, F.P., Singh, R.K., & Kong, F. 2014. Physical and storage properties of spray-dried blueberry pomace extract with whey protein isolate as wall material. Journal of Food Engineering, 137:1-6. Giancarlo, S., Rosa, L.M., Nadjafi, F., & Francesco, M. 2006. Hypoglycaemic activity of two spices extracts: rhus coriaria L. and bunium persicum boiss. Natural Product Research, 20(9):882-886. Goula, A.M., & Adamopoulos, K.G. 2010. A new technique for spray drying orange juice concentrate. Innovative Food Science & Emerging Technologies, 11(2):342-351. Goula, A.M., & Adamopoulos, K.G. 2008a. Effect of maltodextrin addition during spray drying of tomato pulp in dehumidified air: I. drying kinetics and product recovery. Drying Technology, 26(6):714-725. Goula, A.M., & Adamopoulos, K.G. 2008b. Effect of maltodextrin addition during spray drying of tomato pulp in dehumidified air: II. powder properties. Drying Technology, 26(6):726-737. Goula, A.M., & Adamopoulos, K.G. 2005. Spray drying of tomato pulp in dehumidified air: П. the effect on powder properties. Journal of Food Engineering, 66(1):35-42. Goula, A.M., Adamopoulos, K.G., & Kazakis, N.A. 2004. Influence of spray drying conditions on tomato powder properties. Drying Technology, 22(5):1129-1151. Gündüz, G.T., Gönül, S.A., & Karapinar, M. 2010. Efficacy of sumac and oregano in the inactivation of salmonella typhimurium on tomatoes. International Journal of Food Microbiology, 141(1-2):39-44. Jinapong, N., Suphantharika, M., & Jamnong, P. 2008. Production of instant soymilk powders by ultrafiltration, spray drying and fluidized bed agglomeration. Journal of Food Engineering, 84(2):194-205. Kanakdande, D., Bhosale, R., & Singhal, R.S. 2007. Stability of cumin oleoresin microencapsulated in different combination of gum arabic, maltodextrin and modified starch. Carbohydrate Polymers, 67(4):536-541. Kha, T.C., Nguyen, M.H., & Roach, .P.D. 2010. Effects of spray drying conditions on the physicochemical and antioxidant properties of the Gac (momordica cochinchinensis) fruit aril powder. Journal of Food Engeeniring, 98(3):385-392. Kosar, M., Bozan, B., Temelli, F., & Baser, K.H.C. 2007. Antioxidant activity and phenolic composition of Sumac (rhus coriaria L.) extracts. Food Chemistry, 103(3):952-959. Krishnan, S., Bhosale, R., & Singhal, R.S. 2005. Microencapsulation of cardamom oleoresin: evaluation of blends of gum arabic, maltodextrin and a modified starch as wall materials. Carbohydrate Polymers, 61(1):95-102. Laine, P., Kylli, P., Heinonen, M., & Jouppila, K. 2008. Storage stability of microencapsulated cloudberry (rubus chamaemorus) phenolics. Journal of Agricultural and Food Chemistry, 56(23):11251-11261. Mishra, P., Mishra, S., & Mahanta, C.L. 2014. Effect of maltodextrin concentration and inlet temperature during spray drying on physicochemical and antioxidant properties of amla (emblica officinalis) juice powder. Food and Bioproducts Processing, 92(3):252-258. Moreira, G.E.G., Costa, M.G.M., de Souza, A.C.R., de Brito, E.S., de Medeiros, M.D.F.D., & de Azeredo, H.M.C. 2009. Physical properties of spray dried acerola pomace extract as affected by temperature and drying aids. LWT-Food Science and Technology, 42(2):641-645. Mullen, W., Stewart, A.J., Lean, M.E.J., Gardner, P., Duthie, G.G., & Crozier, A. 2002. Effect of freezing and storage on the phenolics, ellagitannins, flavonoids, and antioxidant capacity of red raspberries. Journal of Agricultural and Food Chemistry, 50(18):5197-5201. Nadeem, H.S., Torun, M., & Ozdemir, F. 2011. Spray drying of the mountain tea (sideritis strica) water extract by using different hydrocolloid carriers. LWT-Food Science and Technology, 44(7):1626-1635. Nicoli, M.C., Anese, M., & Parpinel, M. 1999. Influence of processing on the antioxidant properties of fruit and vegetables. Trends in Food Science & Technology, 10(3):94-100. Nohynek, L.J., Alakomi, H., Kahkonen, M.P., Heinonen, M., Helander, I.M., Oksman-Caldentey, K., & Puupponen-Pimia, R.H. 2006. Berry phenolics: antimicrobial properties and mechanisms of action against severe human pathogens. Nutrition and Cancer, 54(1):18-32. Paini, M., Aliakbarian, B., Casazza, A.A., Lagazzo, A., Botter, R., & Perego, P. 2015. Microencapsulation of phenolic compounds from olive pomace using spray drying: a study of operative parameters. LWT-Food Science and Technology, 62(1):177-186. Pesek, C.A., & Warthesen, J.J. 1987. Photodegradation of carotenoids in a vegetable juice system. Journal of Food Science, 52(3):744-746. Quek, S.Y., Chok, N.K., & Swedland, P. 2007. The physicochemical properties of spray-dried watermelon powders. Chemical Engineering and Processing: Process Intensification, 46(5):386-392. Rice-Evans, C., Miller, N., & Paganga, G. 1997. Antioxidant properties of phenolic compounds. Trends in Plant Science, 2(4):152-159. Santhalakshmy, S., Bosco, S.J.D., Francis, S., & Sabeena, M. 2015. Effect of inlet temperature on physicochemical properties of spray-dried jamun fruit juice powder. Powder Technology, 274:37-43. Scoville, E., & Peleg, M. 1981. Evaluation of the effect of liquid bridges on the bulk properties of model powders. Journal of Food Science, 46(1):174-177. Shahidi, F., & Han, X.Q. 1993. Encapsulation of food ingredients. Critical Review in Food Science and Nutrition, 33(6):501-547. Singleton, V.L., & Rossi, J.A. 1965. Colorimetry of total phenolics with phosphomolybdic-phosphotungstic acid reagents. American Journal Enology Viticulture, 16(3):144-158. Wagner, L.A., & Warthesen, J.J. 1995. Stability of spray dried encapsulated carrot carotenes. Journal of Food Science, 60(5):1048-1053.